Ductless / Mini-split heat pumps are showing up more and more as an option for homeowners and business owners in the Charleston SC area. These relatively small units certainly pack a powerful punch. Not only are they energy efficient, but they also are very versatile and quiet! So, where would you use one of these units? Here are a few example applications, however there are many others. These ductless / mini-split heat pumps have two main components. These components are very similar to traditional heat pumps in that they have an outdoor condensing unit and an indoor air handling unit. The main advantage of the ductless / mini-split system is the flexibility for zoning and their small size. With the ductless / mini-split, you can set up several zones using one outside condensing unit. What makes this awesome is that each room has its own thermostat, and you only have to condition the air in the rooms that you or your family are present. All of the connecting lines (ie, line set, electrial, drain, etc) are enclosed in a conduit, and connects the two components together to form the system. Notice that there wasn’t any mention of “duct work”. Another advantage to a ductless / mini-split system is the fact that there isn’t any duct work. In fact, most systems with duct work can lose 30% or more energy consumption, especially if the duct work is located in an attic or another unconditioned space. Whether you have 10%, 20% or 30% loss or more, loss is still a loss. With ductless mini-splits systems, there isn’t any loss! Additionally, there is the flexible interior design advantage of the ductless / mini-split system. There are several indoor units to choose from. These indoor units can be put on a wall, or suspended from a ceiling and flush mounted in the ceiling. Here are a few examples of the indoor units. 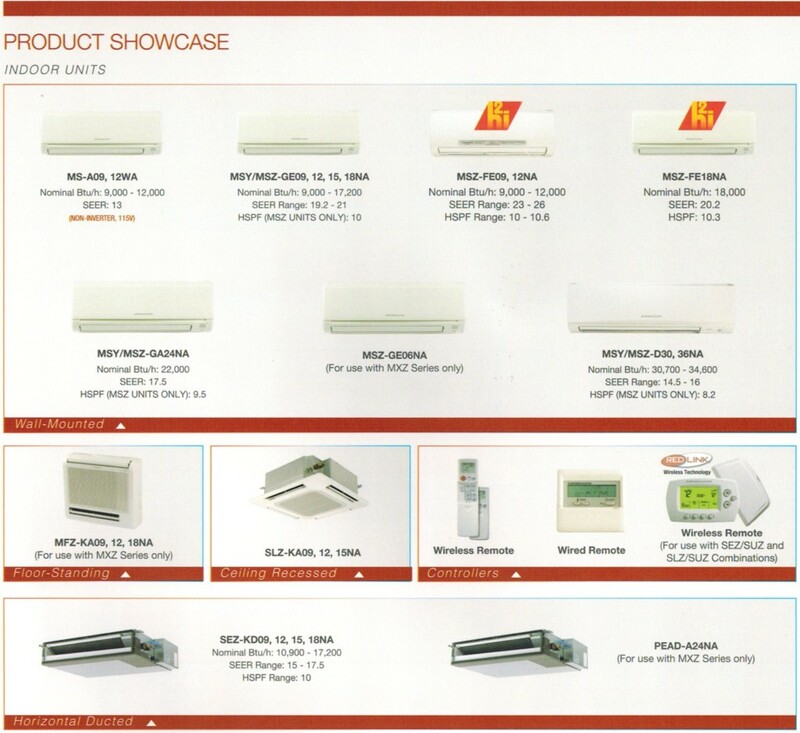 These are examples of wall mounted, ceiling recessed, floor mounted and ducted options. When these systems are positioned in high or tough to reach spots, the wireless remote control makes it easy to change the settings. This is room by room comfort control. Finally, the indoor units are very quite. They can operate at levels as low as a human whisper. The outside units operate at a level that is quieter than most refrigerators. A traditional outdoor unit operates at a level close to that of a vacuum cleaner. Are you uncomfortable in your home or office? Are you too hot or too cold? Are you planning an addition that needs air conditioning or heating? If you are, the ductless / mini-split is an option that you may want to consider. Great comfort and efficiency can be yours! Call Arctic Air today to discuss your options.